Fun and culturally informative. This blog takes us into the daily life and adventures of an expat family in Spain. Funny and well written, this is a must read. I love reading about the Wagoner's adventures, observations and spanish culture! Missing you though. Love this blog. It is funny, interesting, informative & written in a manner that makes us look forward to the next episode of the Wagoner's fascinating adventure! Love the fact that they were brave enough to sell their home & all their belongings and move to Spain. It is better than all of the Reality shows on TV. My favorite blog! I just can't decide which Wagoner is my favorite blogger, it's a tie between Heidi, Alan, Lars and Anya. I can't wait to visit them during their adventure in Spain. The Wagoners...living the dream! Love reading about the family life. Makes me jealous!! ;o Sounds like they are having such a wonderful experience! A must read for anyone interested in a fun family who sold everything and are living in Spain where their children are learning a whole new culture and language. I really enjoy this blog as it tells about the little everyday things in life as they are actually experiencing it! I am living vicariously through the stories posted by the Wagoners. It is so exciting to see the pictures and hear of their latest adventure. I would definitely want to visit Spain and some of the places they've written about! A great travel show via the internet! I am loving living vicariously thru the Wagoners Blog. I would love to do what they are doing. Keep up the great blogging! Love trying to guess which Wagoner is writing the blog, and love that they include the kids as bloggers sometimes. So nice to get everyone's point of view of their adventures. It is great to read the adventures of a family who are actually doing what so many of us have dreamed of. What a great blog to follow!! Only problem is it makes me want to pack up my family and move somewhere too!! Not only are they brave and adventurous, but they are an amazing family with so much love between the four of them!! Great Blog, I love the whole family is involved in the blogging. I love reading about the Wagoners. They let everyone in the family contribute. They are experiencing life to the fullest. I wish them all the happiness! I love catching up on the Wagoners' latest adventures! I enjoy reading the Wagoner's Abroad blog because each member of their family writes about their experiences of life in Spain. I like hearing about everyday and travels to other places. Everything is written very well and entertaining to read! Enjoy! Salud! LOVE hearing about your amazing experiences and journey abroad! Creative and fun to read. Makes you want to join them. Love the blog, daily updates, videos and pictures. On my daily list to check out....smart writing....captures your heart. Well done!!!!! Such a great opportunity to learn about the every day ,down to earth aspects of the life of those from another country! I admire the Wagoners for doing something that I would not have the courage to do! Thanks for sharing your adventures with those of us who are not as brave but equally as curious! 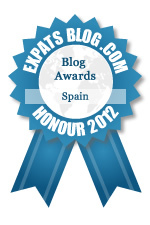 Love this site ... the humor and the good info on things to do in Spain! A great joy to read and catch up with our friends. Their journey has inspired us to try something like this ourselves. If only that employment opporutnity will work out. Been trying hard though! Thanks for doing this and giving our kids a glimpse on the rest of the world out there. I think it is great that the whole family is involved in this Blog. It's a joy to keep up dated with this truly amazing family. This is an amazing family on a brave adventure. Great read! I'm feeling that wanderlust! Awesome family living life to the fullest. I love reading about their adventures and the different cultures they embrace. i look forward to reading the Wagoners blog every day, I feel that I am right there with them. It is funny and very well written by all members of the family. The Wagoners have done something all of us have dreamed of and by keeping a great blog, they allow us to live vicariously through their great adventure. Always a great read. What an amazing and brave journey. So glad we get to share it through this blog. The whole family, not just the grown ups, post. I love them all, but I find that I am a particular fan of Lars. The Wagoners have embraced their adventure in Spain with tremendous spirit and joy. wagonersabroad.com reflects this spirit of adventure as they share their experiences of the Culture and their journey. Love this blog! This is what family living should be all about. Wishing you all the best. I've been to Spain but I always learn something new when I read this blog. I think it's great the kids are along for the journey as well---it shows other families can do the same. Having kids doesn't mean the adventure ends! Travel on! I love the first and second person accounts that are happening to the Wagoners. I really feel like I am there, like a little fly on the wall, taking it all in....the culture, the sights,the sounds, the smells, the people. I love the photography and descriptions that accompany it. It almost makes me want to travel internationally! Great stories, Heidi and her gang are really living their lives. WOW !!!!!!! What a beautiful familly. So fortunate but yet brave to do such a wonderful thing. i only wish i were younger and able to do the same. love the blog and the pic's. Very informative blog that gives real insight into living a normal life in a new country. The good, the bad, and the ugly of adjusting to a new culture. Great mix of practical information and family adventures! I love reading this blog. I love all the pictures and the stories behind each picture. They are an amazing family on an amazing adventure!!! Wagonersabroad.com provides great insight through informative and funny posts that allow us to vicariously experience expat living! Great fun keeping up with all the adventures and pictures! What an incredible journey. You are helping your children make memories for a lifetime. Enjoy and stay safe!! Great blog. Interesting to see how differences between the US and Spain are discovered. Well written and full of insight. I love it. It is like I am there. I am living vicariously thru you guys. I would love to go there someday. I admire your courage to just up and move and embrace the culture. You guys are awesome! A great blog about an awesome family living in Spain! I envy you and enjoy reading about blog. please keep posting. great job. one more thing, take advantage of the great cheap seafood there. I love to read the Wagoners stories and adventures.... very inspiring indeed!